In recent years, Chinese policymakers and corporate leaders have focused significant attention on the concept of corporate culture. This book will reveal the political, social and economic factors behind the enormous current interest in corporate culture in China and provide a wide range of case studies that focus on how large corporations like Haier, Huawei and Mengniu have attempted to transform their cultures, and how they represent themselves as complying with the Chinese government’s interpretation of "positive" corporate culture. 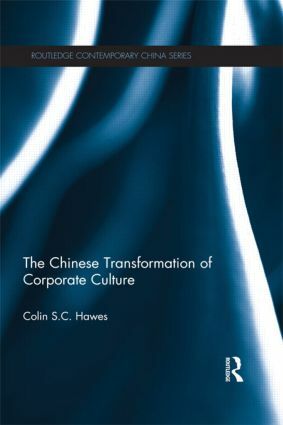 Hawes demonstrates how the foreign concept of corporate culture has been re-defined in China to fit the Chinese political, social and cultural context. He examines how this re-definition of corporate culture reflects a uniquely Chinese conception of the purposes and social functions of the capitalist business corporation and how the Chinese Communist Party’s active promotion of "socialist" corporate culture evidences a shift in the Party’s identity towards a business-friendly champion of corporate and economic development. This work will be of great interest to students and scholars of Asian Studies, Business and Management and Chinese studies. Introduction: The Corporate Culture Phenomenon in China Part 1: The Theory and Politics of Corporate Culture in China 1. Corporate Culture in China: Official and Academic Interpretations 2. Following or Re-Drawing the Party Line? Large Chinese Firms Transforming Their Cultural Values Part 2: Techniques and Vehicles for Transforming Corporate Culture 3. Corporate Culture Propaganda Campaigns: Techniques for Promoting Positive Cultural Values within Chinese Corporations 4. Corporate Magazines as a Vehicle for Promoting Corporate Culture and Cultivating Employees 5. Leading by Example: CEOs, Moral Leadership, and the Promotion of Corporate (and Chinese) Culture6. Corporate Culture and Incentive Systems: Haier and Huawei Conclusion: A Hybrid Socialist Corporate Culture (with Chinese Characteristics)? Colin Hawes is a Research Fellow at the Jack Austin Centre of Asia Pacific Business Studies, Simon Fraser University, Canada, and a Senior Lecturer in the Law Faculty at the University of Technology Sydney. He teaches in the areas of business law, Chinese law, and corporations.